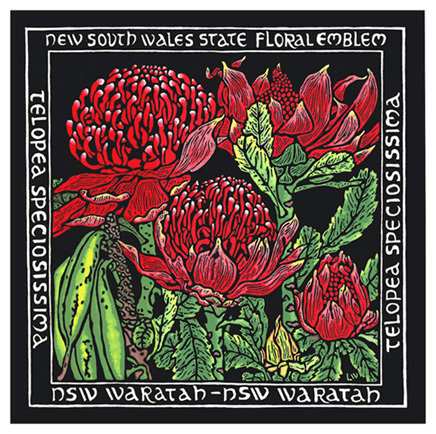 The limited edition linoprints on this website are produced by Lynette Weir are within the individual hand-printed and painted tradition of artist’s printmaking. 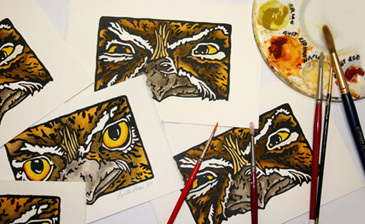 Each work is designed, printed and handcoloured by Lynette Weir and is individually handmade. Below is a very basic quick outline of how linocut prints are developed. The prints begin as drawings, then are developed into designs. 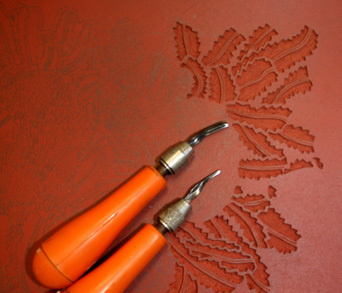 These designs are transferred in reverse onto a special piece of linoleum designed to be carved with lino-cutting tools. The ‘white’ sections of the designs are cut away with a variety of effects being achieved using different tools and techniques. 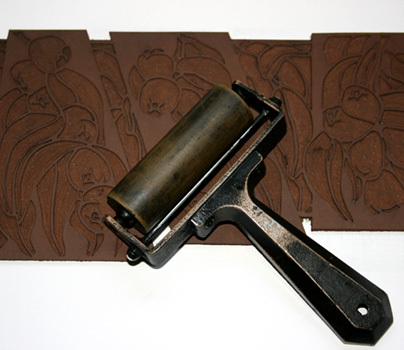 These lino blocks are then evenly inked using a roller with an oil based printing ink. A piece of paper is then carefully placed on the inked lino block. 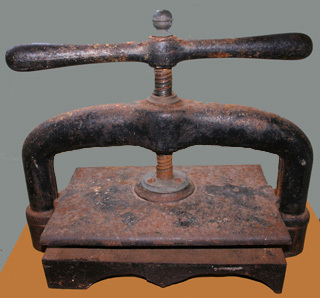 The print is made by the transference of the ink to the paper using techniques such as rubbing the back of the paper with a spoon or the use of a special press. After the ink dries, each print is individually hand coloured using artists watercolours. When you print them, what sort of paper do you use since you’re using watercolour? I use a variety of papers from acid free Hot Pressed watercolour paper (180g-300g) through to some lovely rice papers. It is important to make sure firstly your paper is ‘acid-free’ and therefore is more likely to last over time. These are usually ‘rag’ or cloth papers. The use of oil based inks allows you to use watercolours without the printed ink smudging. As long as it is good quality acid free paper of sufficient ‘weight’ (180g +) to take water without buckling, then it should be ok. Sometimes you will need to experiment a bit. I sometimes print in the initial ‘proof’ printing with a couple of different papers and then play around with the water colour if it is a new paper I am trying out. This how-to is the best I have come across! I have used the pink Speedball material and also the firmer tan one which came already mounted to a wood back. I feel like they both crumbled easily when I attempted to make tiny intricate cuts. I see yours look super clean. Could i be having this issue due to my carving, or is it more likely to be the blades or Lino material?